Hisense 65H9D is a 65-inch Smart LED TV released in 2017. Samsung UN75NU8000 is a 75-inch Smart LED TV of 2018. The size of the units and production year are not the only difference so let’s see what Samsung UN75NU8000 vs Hisense 65H9D can present. 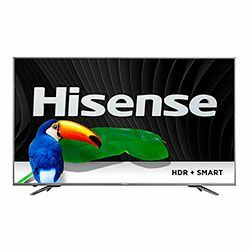 The main features to emphasize are that Hisense 65H9D can’t offer you local dimming, Bluetooth audio streaming, voice remote, picture in picture technology, unlike Samsung UN75NU8000. Both units are not MHL-compatible. Nevertheless, the 65H9D, just like the UN75NU8000, provides UHD Upscaling up to 4K. Hisense 65H9D can actually impress you with its picture. It supports ULED technology that ensures smooth and colorful images. The detailed contrast in the darkest and lightest areas of the picture is achieved thanks to the HDR technology. This model comes in 65-inch class screens versus 75 inches in Samsung UN75NU8000. It is big enough, but it will easily fit your space. Besides, such a size allows enjoying favorite movies on a big screen. Also, Samsung UN75NU8000 provides 550 nits HDR sustained brightness and Supreme UHD micro dimming. The TVs display a clear Full HD picture of 3840 x 2160 pixels resolution. The colors are rich and vivid. The only drawback is that none of them supports 3D video format. Hisense 65H9D lets you use UHD Upscaling to convert lower resolution content to 4K to get premium video quality. It also has built-in apps that can be personalized with your favorite content. Multiple inputs and outputs, among which there are 4 HDMI and 3 USB ports, allow connecting various devices. The unit has outstanding capabilities for entertainment. Except the clear Full HD picture, Samsung UN75NU8000 eliminates clutter thanks to the Samsung Clean Cable Solution. The unit has One Remote that automatically detects and operates all devices and content. Also, One Remote, universal guide and voice assistance let you find streaming and live TV shows effortlessly. The TV is really powerful and easy to handle. The TVs have flat screen design and both models are presented in black. Samsung UN75NU8000 is bigger and weighs more. Hisense 65H9D has for legs, while, the UN75NU8000 a has single leg. The units stand firmly on a flat surface and can be wall mounted if you prefer it more. I think that both TVs have an attractive design and look nice from any angle. So you just need to compare the way they look to decide which one you like more. HDR10 technology displays all the picture nuances.